Morning after breakfast visit Kuensel Phodrang (Buddha Statue) a place for refreshing with a huge statue of Buddha on the top of the Kuensel Phodrang, National Memorial Chorten (Monument) & Folk Heritage Museum. Afternoon visit Sangaygang View Point, Changangkha Monastery, Takin Preserve Centre, the national animal of Bhutan can be seen here, Tashichho Dzong (Fortress of the Glorious Religion). Overnight stay at Thimphu. After breakfast start an excursion to Punakha (4298 ft.) / Wangdue, On the way Stop at Dochu-La-Pass (3150 mts.) 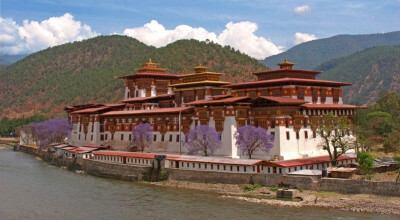 to view the higher Himalayas, visit Punakha Dzong – built in 1637 by Zhabdrung Ngawang Namgyal. For many years until the time of the second king, it served as the seat of the Government. The Dzong was named Druk Pungthang Dechen Phodrang (Palace of Great Happiness). Punakha is still the winter residence of Je-Khenpo and King Jigme Dorji Wangchuck convened the first National Assembly here in 1952. After that take a short and easy hike to visit the Chhimi Lhakhang – The Temple, also known as “The Temple of Fertility” was built by Lama Drukpa Kuenley, “The Devine Mad Man”. Evening back to Thimpu. Overnight stay at Thimpu. After breakfast transfer to Paro( 7483 ft.). On the way visit the Tamchog Lhakhang – It is situated between Thimphu and Paro and it was built in the 13th century by Thangthong Gyalpo. He is also known as the Iron bridge builder. Situated on a hill top, we have to cross an ancient style bridge to reach the temple. On arrival in Paro, check in at the hotel. Afternoon visit Ta Dzong – National Museum with an excellent collection of arts, relics, religious thangkha, etc. Rinpung Dzong – Meaning “fortress of the heap of jewels”. The dzong now serves as the administrative and judicial seat of Paro. Overnight stay at Paro. Do not carry Indian Rs. 500/- or Rs. 2,000/- currency notes. It is illegal.